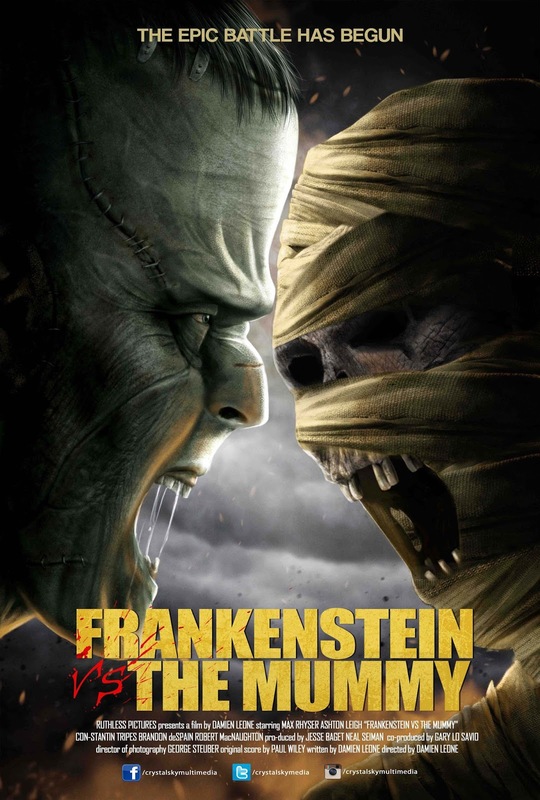 A monstrous of a movie is born in “Frankenstein Vs. The Mummy” when Dr. Victor Frankenstein and Egyptologist Naihla Khalil, who are both professors at a leading medical university. Victor’s latest grisly “experiment” is the re-animated corpse of a sadistic madman and Naihla’s most recent find is the cursed mummy of an evil pharaoh. When the two monsters face-off in an epic showdown, no one is safe. Can the rampage be stopped and contained before it’s too late? The movie is set in motion when in New York, the professor of the medical university Dr. Victor Frankenstein played by Max Rhyser pushes the possibility of life beyond death by buying corpse to reanimate it. Meanwhile, Egyptologist Naihla Khalil (Ashton Leigh), from the same university, has just returned from an expedition and brought the Mummy of Usekara (Brandon deSpain), an evil and cruel pharaoh that was cursed, leaving his soul trapped in his mummified corpse. Victor and Naihla have a crush on each other and they date. Meanwhile Professor Walton (Boomer Tibbs), who is chief of department where Naihla works, accidentally releases Usekara's soul and is possessed by him. He kills his assistant Isaac (Robert MacNaughton) and his blood awakes the Mummy. Then Walton lures his student Lenora (Stefanie Merola) and the Mummy eats her heart. Frankenstein's monster (Constantin Tripes) is reanimated and Victor is surprised with his capacity. But soon both monsters want Naihla: Frankenstein's creature to force Victor to transfer his brain to a new body and the Mummy believes she is the sorcerer that trapped his soul and wants Naihla to call off the spell. “Frankenstein Vs. The Mummy” opens November 4 in cinemas from CrystalSky Multimedia.